The simple and easy ETF screener is a good tool for etf trader. Such a simple tool is now available on FinViz site for every trader or investor. The usage is not complicated and this ETF screener can be used to select many different exchange traded funds. The first step in any usage of this screening tool for filtering exchange traded funds is to pre-select that only ETFs will be used. Actually the FinViz database includes over 1200 exchange traded funds. This complete list can be filtered by many different parameters. You could select them using your own screening system rules. My technically based etf trading strategies specify several different technical parameters that could be used for further filtering of exchange traded funds. The first category could be chart pattern. FinViz is able to scan the database for many different chart patterns. Typical and often used chart patterns are double or triple tops and bottoms and head and shoulders as typical reversal patterns. Example of one results provided by this screener is shown below. The EEM – broad Emerging markets etf is in rising bullish channel. It is also possible to make screener looking for specific candlestick. 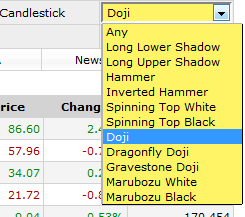 It is possible to find ETFs with Hammer or Doji. The list of parameters that can be set for exchange traded funds screener is large. It is possible to combine fundamentals and technicals together with some descriptive parameters like the price or volume level.